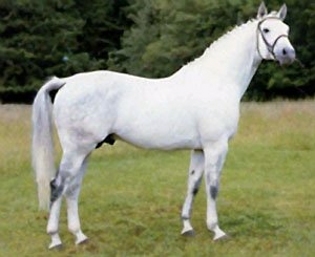 Magician gf Cremello Stallion - standing at stud in Devon. 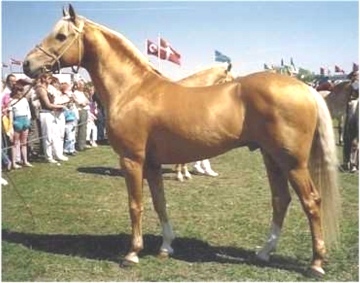 Magician's breeding is dominated heavily by Hannoverian and Trakehner blood, such as MARDUC one of the best Trakehner stallions for dressage. By Halali (Trak.) out of Madeira II (Trak) Died 1995. Marduc is widely considered to be one of the most important Trakehner stallions of today, having previously been ranked the highest Trakehner dressage sire in the world with a very impressive Dressage index of 155. 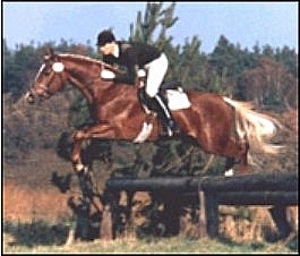 He was awarded Elite status in 1995 for his breeding record. Also included in his pedigree the Hannoverian Weltmann by Wendekreis. 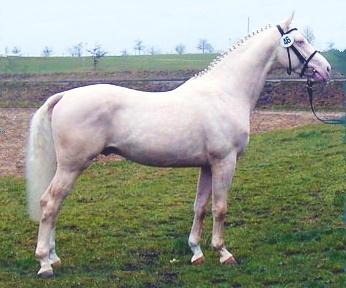 MAGICIAN GF is by Mascarpones Erbe whose sire Mascarpone GF, was the first ever Cremello warmblood licensed for warmblood breeding.